Adding a watermark to an image is a step that shouldn’t be overlooked. First of all, because it can protect your authentic images from being illegally used by others. Second of all, because it can become a powerful marketing tool that may drive traffic to your website and bring new clients. 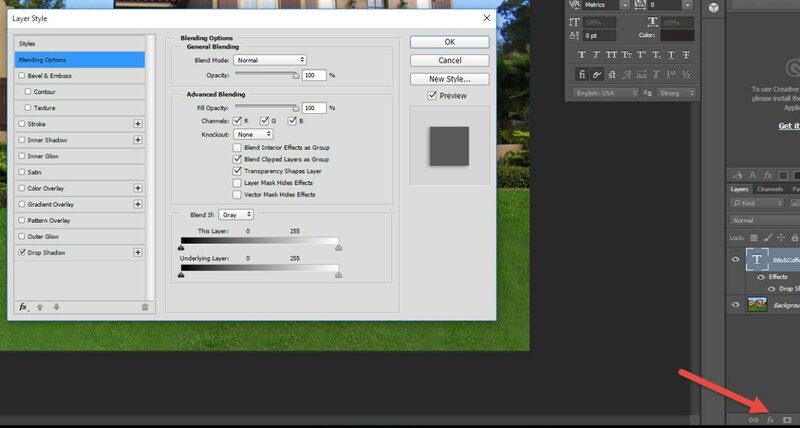 This Photoshop tutorial will show you how to watermark an entire folder of photos at once. This way you can save a considerable amount of time and implicitly improve your productivity. The first thing you have to do is open one of the images in the selected folder. In order to do this go to File -> Open and select the image. For our next step we have to use the Actions panel provided by Photoshop. Basically we are going to tell the software to record all the actions we carry out from now on and reproduce them later on. These are the steps you need to follow: go to Window -> Actions, click the “Create new Action” button, give it a proper name, in our particular case “Watermark”, and hit “Record”. This is the step where you choose which type of watermark you want to use and where to place it. If you’re using a copyright notice, it’s advisable to position it in the lower right corner. This way it will be less obtrusive and it will not cause distraction from the image. Select the Horizontal Type Tool and begin typing the name of your watermark. It can be your name, the name of your website or anything else you wish. Then change its appearance to your liking by playing around with the font, size, color or level of opacity. If you want to make your watermark stand out, Photoshop gives you the possibility to apply certain effects. For that you need to click on “fx” on the lower right panel and then Blending Options. Here you can play around with Bevel & Emboss to add highlights and shadows, add a stroke, inner/outer glow and many more. Of course, this step is completely optional and depends on each user’s individual preferences. 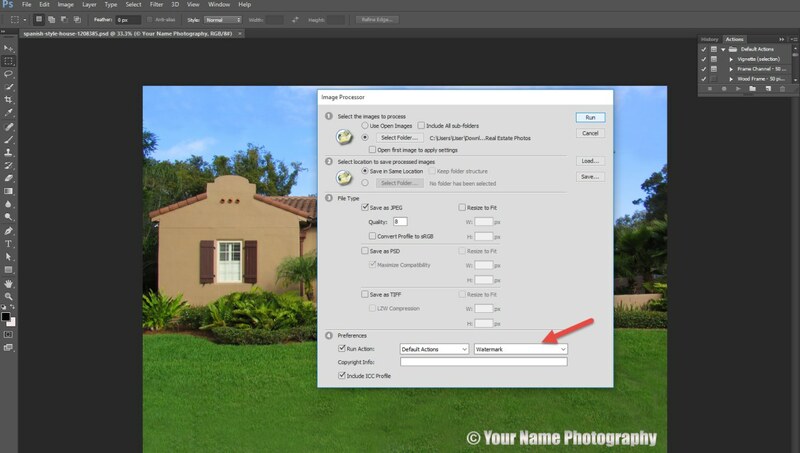 This following step is very important, because it will make sure the watermark you apply on the initial image will maintain its position on all processed photos from your selected folder. 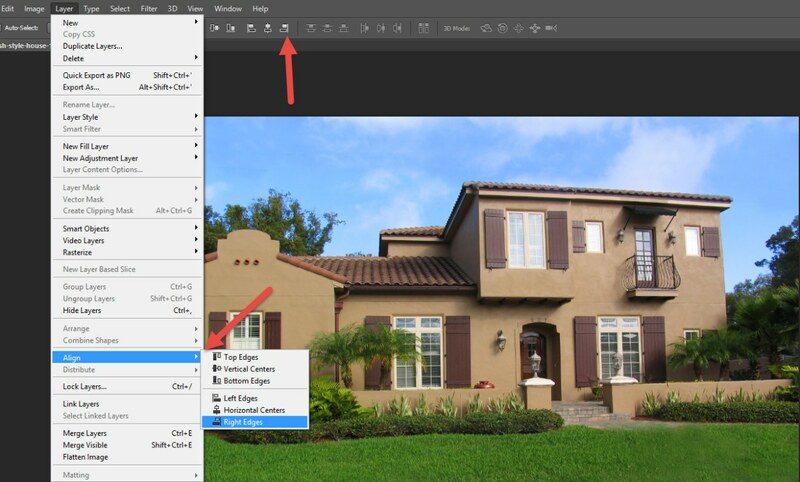 Here’s what you have to do: in the Layers tab on the bottom right of your screen select both the image and text layer by hitting Ctrl+Click. Now take a look at the main toolbar and you’ll see that the Arrange buttons are now clickable. Click the “Align right edges” button and then the “Align bottom edges” one. As an alternative, you can go to Layer -> Align -> Right Edges, then Layer -> Align -> Bottom Edges. Regardless of the method you choose, it will position the watermark in the the lower right-hand edge. In case you feel it got too stuck to the edge, you can opt for a little padding. In order to do that, select only the Text layer and then, using your arrow keys, move it to the left or up until you find a position that suits your taste. Once you’re done, you go again to the Actions panel and hit the square button that says “Stop Recording”. At this point you can close the initial photo, as you would be needing it anymore. Now all there’s left to do is automate this process for our entire folder. Go to File -> Scripts -> Image Processors. Select the Folder you want to process, as well as the folder where to save the processed images. Save them as JPEG and choose the quality you want. Make sure that in the Preferences section “Run action” is ticked, select the action you want to perform (we named it Watermark at the beginning) and hit Run. Once Photoshop has finished, you can go to the destination folder where you saved your photos and find them all watermarked.